o Prior to the act, when you reached full retirement age you could file for only a spousal benefit and allow your own benefit to accumulate Delayed Retirement Credits, and then switch later to your own larger delayed retirement benefit. o Before, if you were not eligible for a spousal benefit because your spouse had not yet filed, you didn’t have to take it. You could later, have the choice of when you add the spousal benefit. o Now, if you file for a retirement benefit, and later become eligible for a spousal benefit, the spousal benefit must immediately be paid upon your eligibility. o There is no longer the month of entitlement rule that allows you to avoid eligibility and then later switch over. o Restricted application for only spousal benefit with ability to later switch to retirement benefits will no longer be available for people born on 1/2/54 or later, age 62.
o If you have a spouse that is claiming off of you, and you suspend your benefit, via a voluntary suspension, in the past, only your benefit would stop and your spouse could continue to claim off of your earning record. Now if you suspend your benefits, your spouses’ benefit will stop as well. o If you suspend your benefit, but could still claim some type of spousal benefit during the suspension, you wouldn’t be able to do that under the new rules. o Under the old rules, you could file and suspend at FRA, wait till 70, and then request a check for all benefits, lump sum, going back to age 66.
o If you request a voluntary suspension before the deadline, you’re grandfathered in. o You can still use voluntary suspension if you claimed early, missed your one year window to withdraw the application. If you filed at 62 and receive the smaller benefit, you can still suspend your benefits at age 66, or whenever, and delay those benefits to a future date like age 70, and earn delayed retirement credits while your benefit is in suspense. No one else can claim on your record during the suspense. o You can have two different rule sets applying to each spouse! Learn what Social Security options you have available, and how Social Security can impact you! 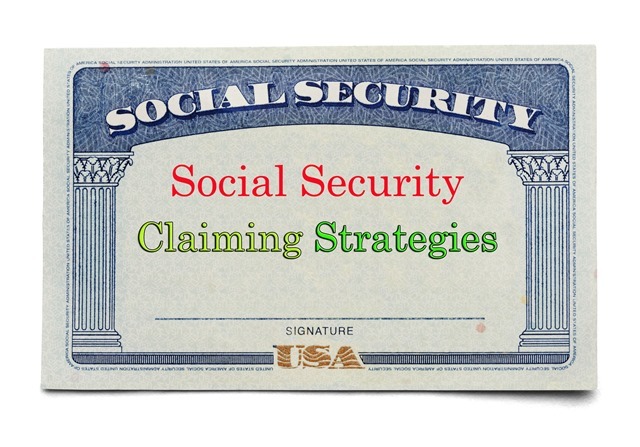 Find out all of your possible Social Security claiming strategy options! rity income under title XVI of such Act. 21 SEC. 831. CLOSURE OF UNINTENDED LOOPHOLES. 10 insurance benefits for such month. 18 self-employment income of such individual,’’. 16 which the individual attains the age of 70. 23 ‘‘under section 202(z)’’ after ‘‘request’’. 2 180 days after the date of the enactment of this Act. 3 SEC. 832. REQUIREMENT FOR MEDICAL REVIEW. 23 date of the enactment of this Act. If you are at least 66 years of age and submit a request to file and suspend before April 29, 2016, then you and your spouse will still be able to take advantage of this valuable benefit for married couples. File and Suspend allows one individual to “file” and then “suspend” their Social Security benefits, which allows the spouse to file and receive spousal benefits. This all comes about because of the Bipartisan Budget Act of 2015 that President Obama signed into law in November of last year. Starting on 4/30/2016, one spouse will have to collect on his or her benefits in order for the other spouse to be able to collect a spousal benefit. Divorced spouses who were married at least 10 years can still collect on their ex-spouses record. Moving forward, for someone who had collected reduced retirement benefits at 62 could suspend their benefits at 66 and then increase their monthly benefits until age 70. If you are at least 66 by 4/29/2016, then find out what your claiming strategies are by clicking on the LINK below! How does working after retirement affect Social Security? What happens to my Social Security income if I continue working after retirement? It depends on how old you are….. Working after retirement can impact your Social Security benefits, health insurance and taxes. If you decide to go back to work after you have started Social Security benefits, this could impact the amount of Social Security that you will receive and your Medicare and tax payments. 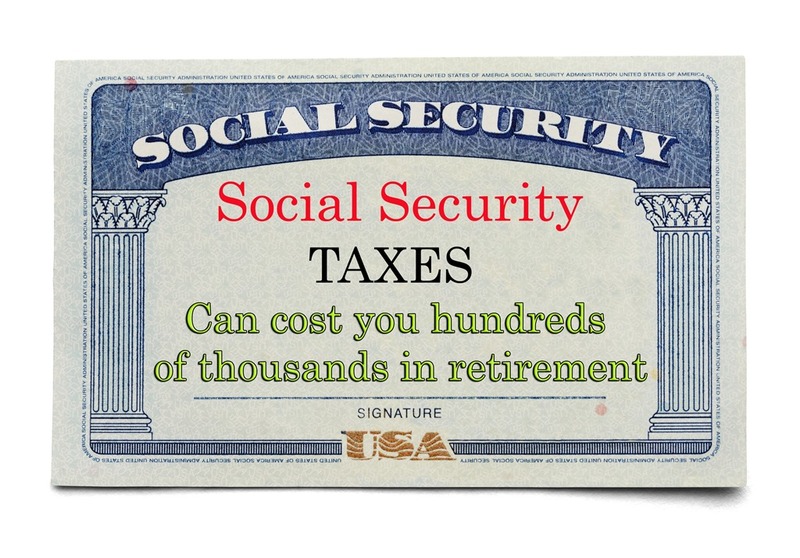 How much can you make in retirement and still get Social Security benefits if I am under 66? If you are under full retirement age for the entire year, Social Security is reduced $1 from your benefit payments for every $2 you earn above the annual limit. For 2016, that limit is $15,720. You are under age 66 all year and you get $1,000/month from Social Security, and you make $25,720 at a part time job. This is $10,000 over the 2016 limit of $15,720. What happens when you reach the full retirement age of 66? In the year you reach full retirement age, Social Security is reduced $1 in benefits for every $3 you earn above $41,880. Social Security only counts the money that you earn before you turn 66, so if you have an early calendar year birthday in January or February then your benefits are only reduced in the months before you turn 66. In 2016, the limit on your earnings before you turn 66 is $41,880. Once you celebrate the big 66, you can make as much as you want without having a reduction of SS benefits! 85% of which could be included in your taxable income at a 46% rate (TAX TORPEDO), and your Medicare Part B and D premiums could quadruple, but that is for another post….. Same as #1, but You turn 66 and reach full retirement age in August 2016. Your Social Security benefits should be $1,000/month or $12,000/year and you make $63,000 during the calendar year with $44,000 being paid out in the 1st 7 months of the year, January-July. You made $2,120 over the year you turn 66 limit of $41,880. Your Social Security benefits will be reduced from January to July by $706, $1 for every $3 that you made over the limit. Instead of getting $12,000 of Social Security benefits for the year, you get $11,294. Your Social Security benefits are not reduced August-December. They will be taxed though…. What income counts toward my Social Security reduction of benefits if I work in retirement? Social Security only counts the wages that you make from your job, or your net profit if you’re self-employed. As you continue working, your additional earnings will count towards your Social Security monthly benefit calculation, which means that your monthly Social Security payment could increase! If your benefit is wiped out before age 66 because you made a significant amount over the threshold, then Social Security will credit you for the months that you did not receive a benefit, and would increase your benefit amount. Remember, by working in retirement, you could also could contribute to an regular IRA account, a Roth account, or even an Health Savings Account if you are not on Medicare. Sweet Deal! 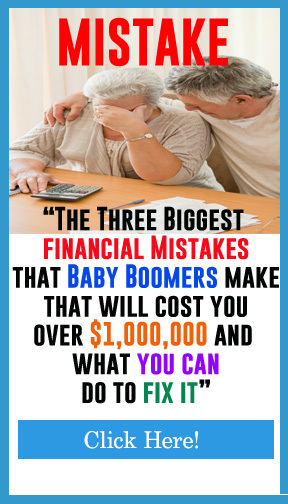 Let’s look at a 66 yr old married couple who needs $100k gross income in retirement. They get $48,000 in combined Social Security income, and take $52,000 out of their IRA to equal $100,000. Their total tax payable would be $9,734. Without proper tax planning in retirement, 69% of their Social Security benefits, or $33,200 is included in their taxable income. Remember, this is the same Social Security that there were already taxed on for their entire working lives via payroll deductions, and now they’re being taxed again when they receive it? 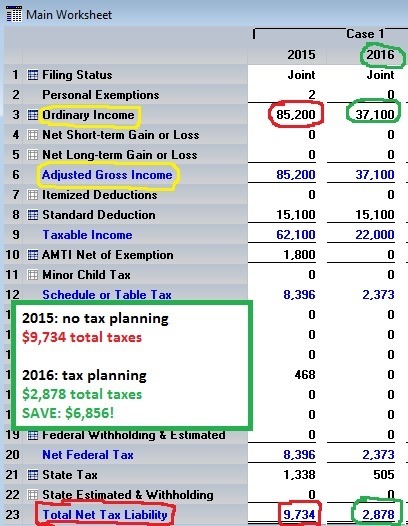 2015 shows the couple doing no tax planning. Their ordinary and adjusted gross income is $85,200 after taxing the 31% of their Social Security benefits that isn’t counted toward income out of the equation. After their standard deductions and exemptions, their taxable income is $62,100 for a tax liability of $9,734. 2016 shows that same couple, with the same $100,000 of gross income, but with a little bit of pro-active tax planning. Here instead of taking $52,000 out of their 100% taxable IRA account, they only take $26,000 out, and pull another $26,000 from one of their FIVE COMPLETELY TAX FREE accounts that they had set up in advance with their Anthony Capital advisor. Income from these accounts don’t count towards Social Security taxes or Medicare Part B &D premium surcharges. They only pay $2,878 in taxes, saving them $6,856 a year. Over a 30 year retirement life, saving $6,856/year in taxes with a little bit of planning grows to over $845,659 at 8%!! You should get a 2nd Opinion review to make sure that you are claiming the correct amount of Social Security—the amount that will maximize your lifetime benefit. Also, you need to integrate your Social Security income with a comprehensive tax, investment, insurance, Medicare, Long Term Care, home equity, and legacy/estate plan. Request a 2nd opinion today, it could save you thousands!